Originally, Charles Alfred and Alice Johnson intended to build a modest home on their 160-acre piece of Heaven. But perhaps in homage to the magnificent expanse of land before them or because of their interest in English and Scottish architecture, their plans grew. Ultimately, a castle designed by renowned Denver architect Burnham Hoyt rambled to 26 rooms and more than 10,000 square feet. Named Charlford for sons Charles and Gifford, the castle was purchased in 1954 by philanthropist/art collector/all-around prominent citizen Tweet Kimball, who renamed the edifice Cherokee Castle. Castle. The consummate hostess, Tweet would instruct her butler to welcome her endless stream of foreign guests by hoisting the flag of a visitor’s home country so that it could be seen on approach. But as much as she loved the castle and entertaining, Tweet also adored the land and amassed neighboring properties until she owned a total of 4,500 acres. 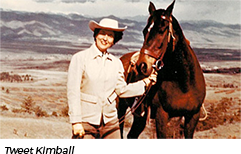 Upon her death in 1999, she willed 1,000 acres of her beloved “Summer Pasture” to residential development and the remaining 3,500 acres to the Cherokee Ranch and Castle Foundation. The Cherokee Ranch and Castle present a rich ongoing performing arts series in the castle parlors and, weather-permitting, on the terraces. Performing arts partners include The Colorado Symphony Orchestra’s Chamber Musicians, The Denver Center Theatre Company, The Colorado Children’s Chorale, University of Denver’s Lamont School of Music, The Denver Brass, and The Aries Brass Quintet. For a schedule of events and to purchase tickets, please call (303) 688-4600. Reservations are taken Monday through Friday from 9:30 am to 2:30pm. You may also visit the Cherokee Ranch Website for more information. But Tweet’s legacy exceeded her property lines and her lifespan because over the years, her neighbors also made promises to keep this land untouched. Today the wild inhabitants of the area – and those who gaze upon them – enjoy more than 16,000 acres of wide-open spaces. A reverence for the land is also evident at The Keep: A portion of the sale of every residential property goes to the Foundation to assure its operations in perpetuity. In exchange, The Keep homeowners enjoy special access to the beautiful Cherokee Ranch and Castle. 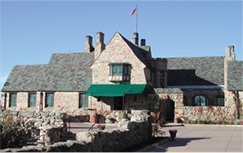 Cherokee Castle is a distinctive landmark with expansive views of the Front Range. Home to a diverse collection of art and antiques, the castle exhibits paintings by fifteenth and sixteenth century European artists and original drawings by Sir Christopher Wren, the architect of St. Paul’s cathedral in London. The collection of art and antiques took place over several generations. Other collections on display include important literature by Audubon, Dickens, and Shakespeare. Tweet Kimball’s 14,000 books remain on the shelves and her art and antiques fill the parlors, often overflowing with guests just as they were when she lived there. Performing arts groups call the castle home in the summer months, residents of The Keep host family gatherings, and attend afternoon High Tea, and the castle continues to be a destination for all who are interested in history and art. From central Denver: Take Interstate 25 South exit 188/Castle Pines Parkway. 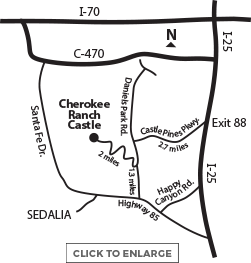 Turn right and continue until Castle Pines Parkway ends. Turn left on Daniels Park Road and continue for 1.6 miles. Our entrance is on the right. From west Denver: Take Colorado Highway 85 south past Sedalia. Turn left on Daniels Park Road. Our entrance is 1.3 miles ahead on the left.